If you’re looking at sofas, it makes sense to find one that’s worth your investment. This means getting a couch that excels in elegance, durability and comfort. And that’s what every sofa from Brandenberry is all about. Because they’re Amish-built for great looks, strength and long life. The Bow Arm Sofa blends graceful design and solid construction. 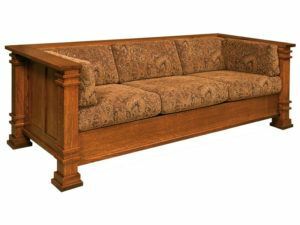 Comfortable and durable, this Cubic Panel Sofa features Quarter Sawn White Oak with rectangle panels and corbels on each corner. 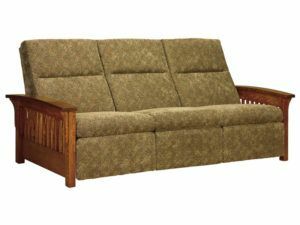 You will love Cubic Slat Sofa for entertaining your guests or lying down for a cat nap on this sofa featuring contemporary fabric and solid handcrafted design. 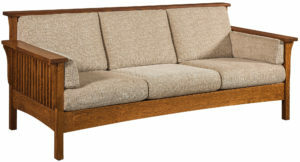 Plush upholstery and sturdy craftsmanship mark the Diamond Sofa. 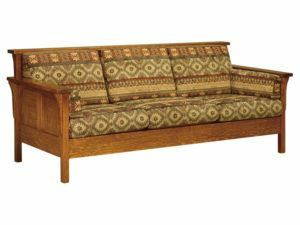 The Durango Sofa features the finest quality construction and elegant design. 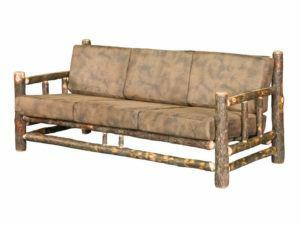 Solid construction and a rustic hickory style accent the Hickory Lodge Sofa. 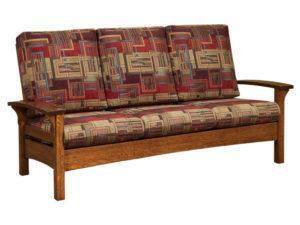 Curved slats and sturdy construction meet in this Hickory Sofa. Make yourself comfortable and let go of the day’s tension in this Highback Panel Sofa with highback panels. 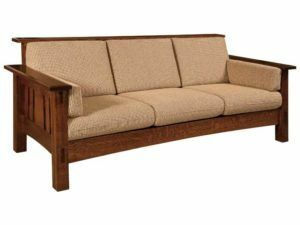 Featuring highback Mission Slats, corbels on each corner, and Quarter Sawn White Oak wood, this Highback Slat Sofa is the perfect addition to any living room collection. 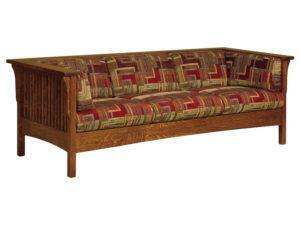 Wood slats and a classic Mission style mark the McCoy Sofa. 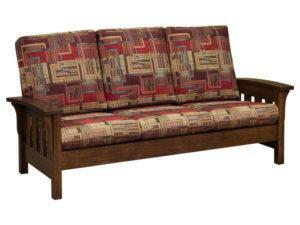 Brandenberry Amish Furniture offers a huge lineup of expertly crafted sofas. They’re all quality built from the inside out. 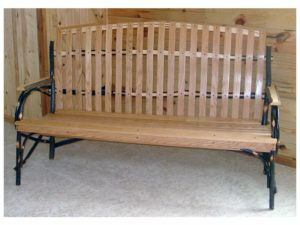 Because Amish artisans custom build each sofa. And they start with a solid hardwood frame. Plus all the special cabinetwork — such as slats and mortise and tenon joints — showcase the finest cabinetwork. 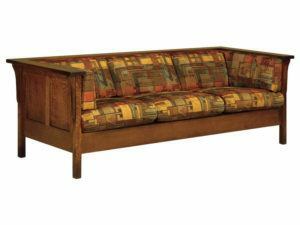 Our sofas come in a variety of styles. So you can choose traditional styles, such as Shaker and Mission. Or, you may wish to get a modern sofa. Plus, some of our styles fall somewhere in between. 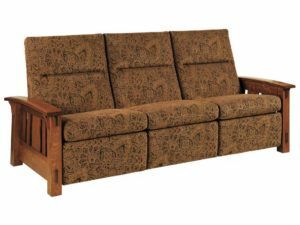 You can customize any of our sofas to your heart’s content. Just tell us your options for designer fabric. Plus hardwood stain color. And any other special feature. 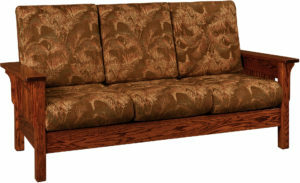 We will build you the perfect sofa. Also, if you’re close to Shipshewana, Indiana, visit our ‘brick and mortar’ store. 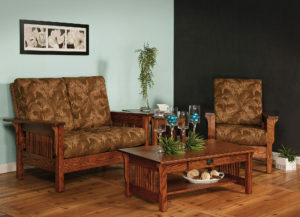 You’ll see for yourself why there’s nothing quite like Amish-crafted, hardwood furniture.